The Congress for New Urbanism will hold its Transportation Summit here in Portland from November 4th to 6th. Get all the details. Apparently truckers like plugging in their big rigs once they try it, but getting trial is a little tricky. 9th-12th grade students in Portland Public Schools now travel free on TriMet. The program is funded by PPS and State Energy Tax Credits. Learn about congestion management programs around the world at this installment of Metro’s Transportation Speaker Series featuring Naveen Lamba from IBM’s Global Business Services.Stockholm, London and Singapore are three cities with prominent congestion charging programs. IBM has a significant role in all three projects and a wealth of lessons learned from these successful implementations. Mr. Lamba will also discuss examples of cities that have unsuccessfully tried to implement congestion management programs. Finally, the presentation will discuss innovative approaches to developing the next generation of congestion pricing solutions. Mr. Lamba is IBM’s global industry leader for intelligent transportation and is based in the Washington D.C. area. He has spent the last 18 years working on intelligent transportation projects around the world for governments and private sector organizations. Mr. Lamba’s work focuses on developing business and technical models suitable for varying economic and social environments. Free and open to the public. This lecture is part of Metro’s Transportation Speaker Series. Reservations are not required. For more information, call 503-797-1916 or visit www.oregonmetro.gov. 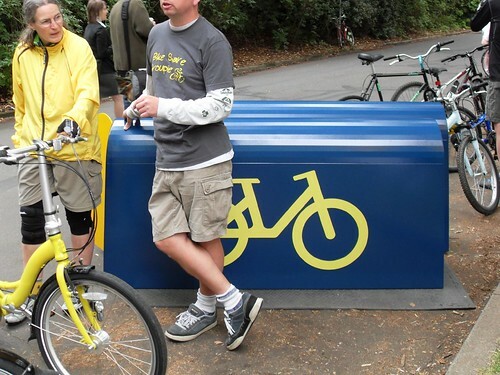 What Will It Take for Bike Sharing to Succeed in Portland? A few weekends ago, we were treated to demos by four bike sharing vendors. You can find my photos and notes after the jump, and Willamette Week has a nice roundup. 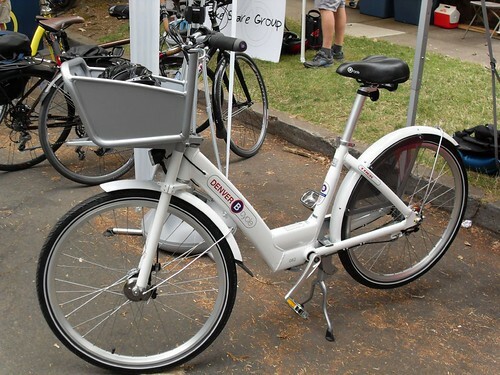 The common factor among all the vendors is that they won’t espouse a preference for a business model – they all say that’s up to the City, which points to the underlying problem: bikesharing probably won’t be self-funded, it will require some kind of subsidy. In other cities the subsidy has been generated by allowing the selling of advertising in public space. But that’s not a fit for Portland – we have a lower tolerance for display advertising, and what we do allow is already booked up. A lower cost model – the leading contenders all have an initial installation cost of $4K per bike. Somebody has to figure out a cheaper entry strategy that takes less hardware. Do we need lockers? Lockers are an answer to the vandalism problem, which seems to vary tremendously by city. Would vandalism be an issue here in Portland? A way to leverage our vibrant bike culture. Current cyclists are NOT the market for a bike sharing system, but my gut tells me that we need to find a way for the cycling community to take some kind of ownership for the success of any system. What might that look like? A Raison d’être. Why would we do this? Cycling is growing rapidly without such a system. What role does a bike sharing system play beyond being cool? Whatever policy basis we find for this needs to align with a funding stream. Upgraded bike facilities in the central city. I think the target market for a system would be the “interested but concerned” category of potential riders who need facilities that feel safe and comfortable. Confident cyclists find downtown’s streets accomodating, but casual riders don’t. We’re going to need many more facilities like the protected lane planned for Broadway. 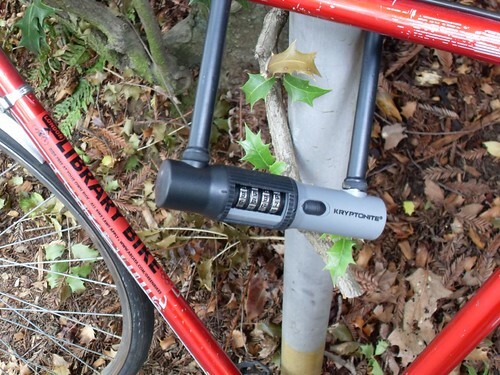 Portland Bicycle Tours will text you the location of a bike and the combination to the lock – this is the hyperlocal, grass roots end of the spectrum. The Bike Share group was touting their Seattle roots. Their gimic is a very low-profile locker. Bcycle is out of Denver. 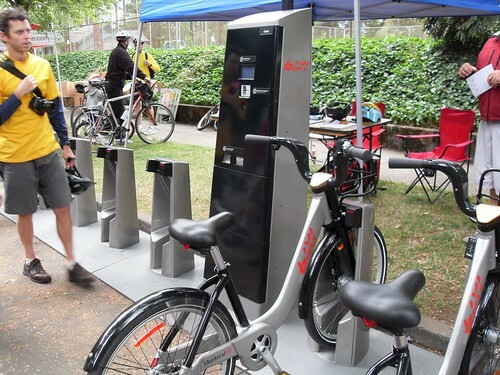 Bixi is clearly the Cadillac of the group, with a model very much like Velib in Paris, and is the only vendor with a deployed system (in Montreal).